seen evidence of this phenomenon in my many years of teaching online. I had experienced connection with students at the heart level in online classrooms, and I had observed and participated in the conditions under which caring and un-caring occurred in online settings. At the time, there was no research to validate my observations so I went back to school and earned my PhD so I could complete research related to the process of conveying and sustaining caring online. I earned my PhD in 2007. My dissertation was on the topic of conveying and sustaining caring in online baccalaureate nursing classrooms. To date, I have completed and published 6 research studies about caring online, listed below. I continue to teach, model, and convey caring online through traditional online nursing education, free and open professional trainings that anyone with access to a computer can complete, and an ongoing international massive open online course (MOOC) entitled “Caring Science, Mindful Practice.” Teaching and doing research related to Watson’s Human Caring Science has fueled and defined my professional and personal life for 30 years and it will continue to do so into the future. If my work helps even one person to better understand and subsequently incorporate Watson’s work into their own daily existence, then my efforts will have been successful. See the links below to download flyers for the upcoming Caring Science, Mindful Practice MOOC and the two free trainings through East Carolina University’s Office of Faculty Excellence. I love teaching these courses and sharing Caring Science with anyone anywhere for FREE. Please join me! Sitzman, K. (2016). What student cues prompt online instructors to offer caring interventions? Nursing Education Perspectives, 37(2), in press. Sitzman, K. (2010). Student-preferred caring behaviors for online nursing education. Nursing Education Perspectives, 31(3), 171-178. Sitzman, K. (2015). Sense, connect, facilitate: Nurse educator experiences of caring online through Watson’s lens. International Journal for Human Caring, 19(3), 25-29. Sitzman, K. (2016). Mindful communication for caring online. 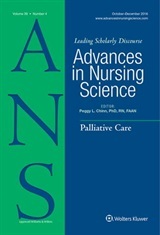 Advances in Nursing Science, 39(1), 38-47. Sitzman, K., & Leners, D. (2006). Student perceptions of caring in online baccalaureate education. Nursing Education Perspectives, 27(5), 254-259. Leners, D., & Sitzman, K. (2006). Graduate student perceptions: Feeling the passion of caring online. Nursing Education Perspectives, 27(6), 315-319. Dr. Sitzman – I was so pleased to see your article on caring in online environments! Your research includes many attributes of virtual presence identified in patient-centered virtual caring relationships: empathy, attentiveness, mindfulness, available, and listening/responding. Your work is a wonderful contribution to the body of knowledge on caring in non-traditional environments.